The 2 year old Israeli political party, Yesh Atid, has decided to go against the BDS movement forming all over the world against Israel, Boycott, Divestment and Sanctions. This is enacted against Israel in order to get them to comply to their wishes, as they see the situation between Israel and Palestinians through rosy eyeglasses. "Boycotts of Israel are economic and political cultural campaigns or actions that seek a selective or total cutting of ties with the State of Israel, Israelis or Israeli corporations." 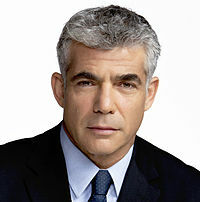 Chairman Yair Lapid, former journalist, formed this party for the secular middle class of Israel. They are more concerned with socio, economic and governance problems than security, so were on the side of Herzog during this past election. Not as well visioned as Netanyahu, in my opinion, he is rising up to fight something major, here, for this is almost as deadly as Hamas has been and who has started up again from Gaza. Being a former journalist, he just may be able to present Israel's case in better light. It was during his visit to New York when Lapid decided to fight BDS. He realized that people who support BDS are the very ones who are backed by a different culture than the west, one who murders homosexuals, beats women and oppresses whole populations. 1. An end to Israel's "occupation and colonization of all Arab lands and dismantling the Wall;"
1. In reply to these slanted goals that do not reflect facts, Israel is not occupying anyone, not Gaza nor Judea and Samaria or East Jerusalem. Gaza is ruled by Hamas from a Democratic election that shouldn't have taken place in retrospect. Judea and Samaria (West Bank) have been run by the Palestinian Authority who has been at the head far longer than he should have-but that is up to the Palestinians. East Jerusalem has been incorporated into all of Jerusalem as it is the Israeli capital. Of course, the Arabs see all of Israel as "ARAB LAND." 2. Arabs in Israel are full citizens and have been. Some are even serving in the IDF. 3. All Palestinians had the opportunity to stay in Israel when their brothers attacked Israel in 1948, and those that fled did not return. Those that stayed became full citizens of Israel. Anything different is up to discussion in peace talks. Most went to Jordan and are Jordanians todaiy. Some are still in refugee camps after 67 years, still being provided for by the UN. . What Israel doesn't need are anymore Hamas types hanging around. I noted in today's news that Iran took out about 23 people from their prison for hanging without any trial. G-d only knows why they were in prison in the first place. Then to be jerked out and hung without a "Hello there" is just unconstitutional in any descent society. We're learning that this world is made up of despicable people, led by IS, of course. Iran not only supports BDS but is supporting their right to build a nuclear power plant as well, and we wonder why. For years they have been against Israel and have not been mum about it, spewing out vile names about Israelis. What ticked Lapid off was the decision of the UK National Union of Students (NUS) to join the BDS movement against Israel. He saw another peg falling to pay homage to the BDS G-d. He's calling on the British government to condemn this move which is stirring up more hatred and which undermines any hope for diplomatic progress. The BDSers are trying to put Israel in a coffin and nail it shut. He's putting this issue at the top of his list of priorities. BDS has been going in the States for some time already. "BDS is on American college campuses, especially on the West Coast Public attention has been focused on successful boycott campaigns staged by anti-Israel groups at American academic associations such as the American Studies Association and the Asian American Studies Association. Now the energy in the Boycott, Divestment and Sanctions (BDS) movement is returning to American college campuses. Anti-Israel groups, such as Students for Justice in Palestine, are preparing to mount massive BDS campaigns on campuses across the country, such as the University of California at Los Angeles. Once again, we can expect Jewish students to face a barrage of anti-Jewish stereotypes and defamations, anti-Israel smears, factual exaggerations, and outright falsehoods, together with just enough factually accurate criticism to disguise the entire charade as a legitimate political movement. Until recently, campus-based BDS campaigns were all losers. " Of all places, college campuses seem to be attacked the most to succumb to the lure of hating Israel. Evidently classes in Middle East history are sorely lacking, or are only telling one version-and it isn't Israel's version of the problems they have faced in the Middle East with their neighbors. Monkey see-monkey do, and these college students are as bad as my 1st graders were in copying someone in class. They obviously are enamoured with the exotic Arab students who are brazenly beating the drums against Israel. Colleges and universities have been ripe for the picking for these hateniks with their vile propaganda. I wonder what American Jews are finally waking up and have the backbone like Lapid to commit to fighting against BDS instead of going along with it? We need to start first before we expect the rest of the world to realize they've been betting on the wrong horse in this race. Update: 12:44pm. In John Hagee's 2007 book, "In Defense of Israel," on page 147 he explains that those replacement theologians teach to support BDS which will economically hurt the "Christ-rejecting" Jews so that they will accept Jesus Christ!" Ultimately, we always get to the heart of matters; religion. What a despicable way to try to convert somebody, but then I've never really seen any nice way.